56henry is all about worship music. Taking modern rock sounds and fusing them with lyrics that speak of the person of God is the backbone of what makes this band exist. The band leads worship weekly for over 800 college students in Birmingham, Alabama in addition to traveling all over the southeast with a message of hope and sounds of praise. 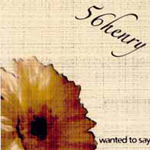 56henrys goal is to present uncompromised truth behind music that hits the listener with its heart and strength. 56henry... worship loud!